Kinder Morgan Canada (KML) has issued an ultimatum to the federal government and province of BC, now saying it will stop any non-essential activities on its $7.4 billion Trans Mountain Expansion (TMEP) until it gets more clarity on path forward. The company says it has already spent $1 billion on the project, mostly on engineering and 2½ years of regulatory reviews. As construction ramps up, KML is slated to spend up to $300 million a month to get the 1,150 km line built, and says it would not be a "judicious use of shareholder funds" to proceed while the project still faces active opposition from the BC government. KML CEO Steve Kean says his company cannot be put in a position to resolve differences between the federal and provincial government, noting "while we have succeeded in all legal challenges to date, a company cannot litigate its way to an in-service pipeline." Kean is giving all stakeholders until the end of May to resolve all legal challenges before proceeding with construction or scrap the project indefinitely. TMEP was granted federal approval in November 2016 subject to 157 conditions, which have mostly been met. The previous BC Liberals issued an environmental assessment certificate for the project, but the project faced a reversal of fortunes after the Liberals were ousted by an NDP/Green Party alliance government, who campaigned heavily on stopping the pipeline at all costs. The Trudeau Liberals politicized TMEP during the last federal election campaign, openly criticizing the National Energy Board (NEB) and environmental review process while campaigning in Vancouver. The Liberals now say Canada's regulatory review process has been fixed, adding more public and First Nations consultation, thereby restoring confidence in the system. A new federal carbon tax was also supposed to provide a social licence for new pipeline construction, which the previous Harper government allegedly failed to obtain. How many tools are left in the toolbox? The Trudeau government has shown great resolve in forcing the carbon tax onto unwilling provinces, threatening to withhold federal funding and even introducing new legislation in the House of Commons. However, the feds have been treading carefully on the subject of TMEP due to important seats in the Vancouver area, where the pipeline faces most of its opposition. Trudeau insists he supports the project since it is in the national interest of all Canadians. Alberta Premier Rachel Notley says her province is prepared to take a financial position in the project to help get the line built. Notley says she is "very hopeful there is a way forward" for all parties, and has called on the federal government to do more. The Canadian Chamber of Commerce warns that political squabbling over TMEP sends a message to the global investment community that Canada is "not open for business." Can Alberta really cut out petroleum supplies to BC? Alberta's NDP government is also introducing at legislation to cut off petroleum supplies to BC through Bill 12, Preserving Canada’s Economic Prosperity Act. The province of BC consumes about 230,000 bbl/day of refined products. BC only has two refineries - the 55,000 bbl/day Parkland Refinery in Burnaby (formerly owned by Chevron Canada) and Husky Energy's 12,000 bbl/day facility in Prince George. 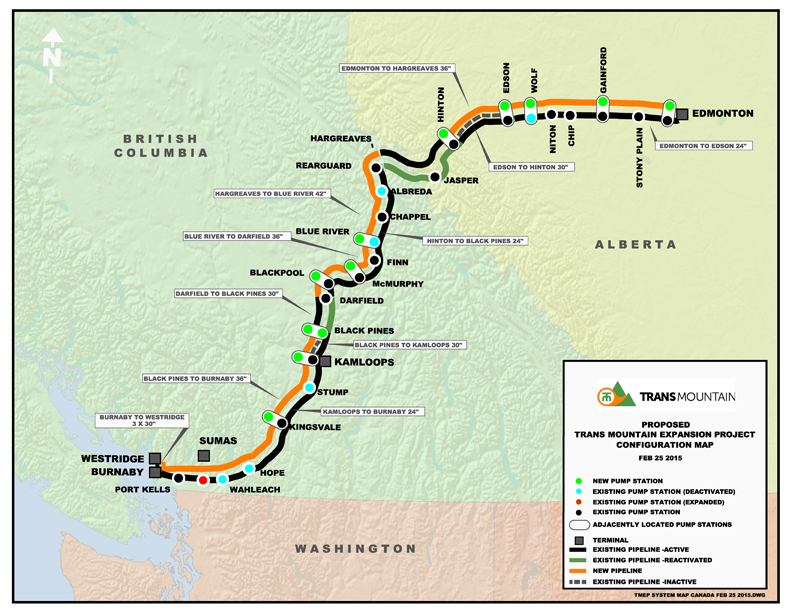 The existing Trans Mountain line delivers about 45,000 bbl/day of refined products into the BC Interior and Lower Mainland. A considerable amount of refined product is also trucked into the province from the Edmonton area. Trans Mountain also ships about 150,000 bbl/day of light crude from Alberta to refineries in Washington State, who then sell refined products back to the Lower Mainland area. Another 60,000 bbl/day of mostly light oil is destined for the Burnaby Refinery, while smaller volumes of heavy oil are exported out of the Westridge marine terminal. It is unclear what would happen to shippers with contracts on the existing Trans Mountain line if flow were to be stopped. Although both Alberta and BC have some stockpiling capacity, a prolonged outage of the line would require Alberta's producers and/or refiners to curtail production. It would also likely cause both the heavy oil and light discount to rise sharply, and send gas prices through the roof for the entire province BC. NDP Leader John Horgan had the audacity to suggest his province should perhaps consider expanding its refining capacity. The Vancouver area was once home to four refineries. Imperial Oil, Shell and Petro-Canada shutdown their three refineries in the mid-1990s, under the watch of the last NDP government. It is also unclear how a new refinery would get its crude feedstock, since both the NDP and Green Party are adamantly opposed to crude oil pipelines and tankers. KML was spun-off from parent-company Kinder Morgan (KMI) in the spring of last year, and insists it is financially sound, with or without TMEP. Shareholders do not appear to be entirely convinced, sending the stock almost 20% lower on Monday morning.